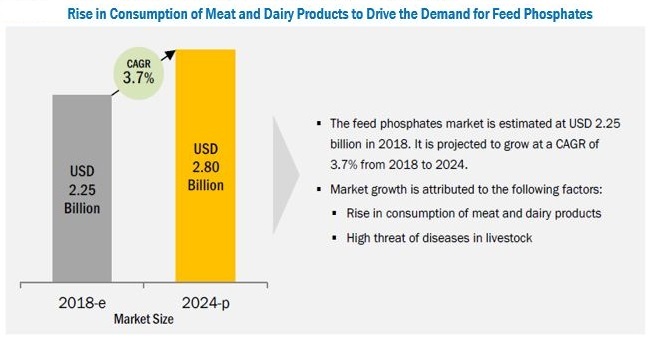 [159 Pages Report] The feed phosphates market was valued at USD 2.18 billion in 2017; this is projected to reach 2.80 billion by 2024, at a CAGR of 3.7% during the forecast period. Feed phosphates are used to optimize the nutritional value of feed and further enhance the quality of meat and dairy products, optimize tenderness in meat, increase selenium content in eggs, and high calcium content in milk. Therefore, the rise in consumption of meat & dairy products and prevalence of diseases in livestock are the factors driving this market. The key players were identified through secondary sources, such as the Food and Agriculture Organization (FAO), the US Department of Agriculture (USDA), International Monetary Fund (IMF), World Bank, and Organisation for Economic Co-operation and Development (OECD), while their market shares in the respective regions were determined through both, primary and secondary research processes. 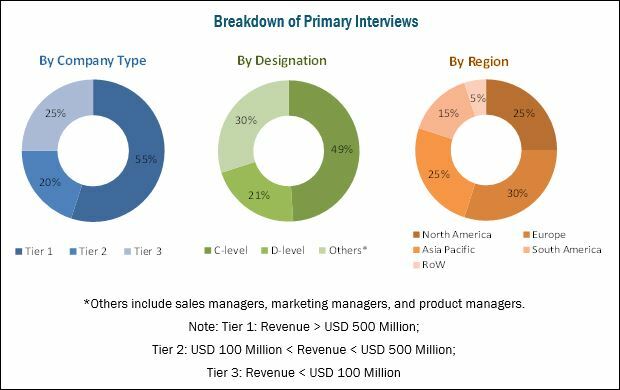 The research methodology included the study of annual and financial reports of top market players, as well as interviews with industry experts (such as CEOs, VPs, directors, and marketing executives) for key insights (both quantitative and qualitative) for the feed phosphates market. The contributors involved in the value chain of the feed phosphates market include raw material suppliers, R&D institutes, feed phosphate distributors, livestock producers, feed manufacturers, government bodies & regulatory associations, and feed phosphate manufacturing companies. The manufacturing companies in the feed phosphates market include The Mosaic Company (US), Phosphea (France), Nutrien Ltd. (Canada), OCP Group (Morocco), Yara International ASA (Norway). The government bodies & regulatory associations include such as the US Department of Agriculture (USDA), the Food and Drug Administration (FDA), and the European Food Safety Authority (EFSA). This research report categorizes the feed phosphates market based on type, livestock, form, and region. The feed phosphates market is estimated to be valued at USD 2.25 billion in 2018 and is projected to reach USD 2.80 billion by 2024, at a CAGR of 3.7% during the forecast period. Feed phosphate is rich in calcium and phosphorus, which are two essential macronutrients in animal diets, ensuring optimal growth, improving gut functionality, increasing fertility, and aiding bone development. As most feed ingredients from plant sources are inadequate for meeting health requirements of livestock, the inclusion of feed phosphates is becoming important. Increasing consumption of meat and dairy products and prevalence of diseases in livestock is driving the market growth. The feed phosphates market, based on type, has been segmented into dicalcium phosphate, monocalcium phosphate, mono-dicalcium phosphate, defluorinated phosphate, tricalcium phosphate, and others. The market for dicalcium phosphate is estimated to dominate in 2018. The monocalcium phosphate (MCP) segment is projected to witness the fastest growth during the forecast period. The growth of the monocalcium phosphate segment can be attributed to some of its advantages, such as neutralizing the harmful effects of various elements including sodium, potassium, and magnesium. In addition, the use of monocalcium phosphate helps in improving the efficiency of carbohydrate, protein, fat, mineral, & energy metabolism in the body, which contributes toward the growth of this segment. The feed phosphates market, by form, has been segmented into powder and granule. The powder segment is estimated to dominate the market in 2018 and is projected to grow at the highest CAGR by 2024. This segment is projected to dominate as it remains the preferred form of feed phosphate among feed formulators and livestock owners and is the key product offered by most of the major market players. The free-flowing structure of the powder form makes its use as a feed phosphate effective by providing consistency to the formulation. The feed phosphates market, by livestock, has been segmented into ruminants, swine, poultry, aquaculture, and others. It was dominated by the poultry segment in 2018 and is projected to witness the fastest growth during the forecast period. The growth in demand for quality meat products has led to an increase in the use of feed phosphates in poultry diets due to its high nutritive value. Due to these benefits, feed phosphate remains a preferred alternative to the traditional feed. For normal growth and skeletal development of poultry, the demand for products rich in calcium and phosphorus has increased, which in turn has fueled the demand for feed phosphates. The increasing demand for poultry meat production is expected to drive the demand for feed phosphates in this segment. The market in Europe is driven by the increasing production and consumption of feed phosphate in the region. Meat also stands as one of the important segments of the European agricultural sector. The policies formed by the EU for meat production encourages safe production of low-cost meat products, which are rich in nutrients. The regulations are imposed to meet the requirements of consumers, encourage livestock producers to use healthy and nutrient-rich feed additives, and balance their impact of production on the environment. Also, the regulations imposed on the use of antibiotics by the EU significantly drives the market for products of natural origin and propels the market growth for feed phosphates. The South American market is projected to grow at the highest CAGR from 2018 to 2024. Countries in this region have been increasing their production of feed phosphates to enhance the meat quality of livestock. Development of the animal husbandry sector also drives the demand for feed additives, which in turn contributes toward the growth of the feed phosphates market. Lack of awareness in developing countries fluctuation in prices of phosphate, and availability of substitutes, such as phytase are the major restraints for the growth of this market. 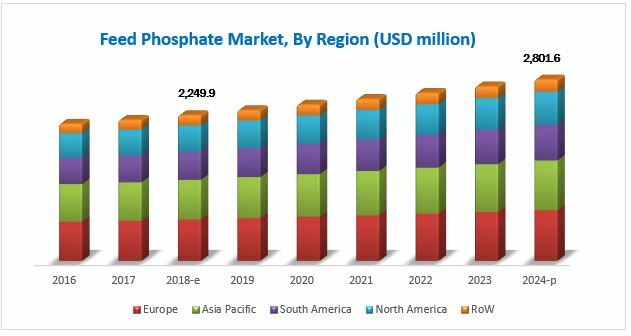 The global market for feed phosphates is dominated by large-scale players, such as The Mosaic Company (US), Phosphea (France), Nutrien Ltd. (Canada), OCP Group (Morocco), and Yara International ASA (Norway). EuroChem Group AG (Switzerland), PhosAgro (Russia), Ecophos Group (Belgium), Sichuan Lomon Corporation (China), Rotem Turkey (Turkey), Fosfitalia Group (Italy), J.R. Simplot Company (US), Quimpac S.A. (Peru), Wengfu Group (China), and Sinochem Yunlong Co., Ltd. (China) are the other players that hold a significant share in the feed phosphates market. 11.13 Sinochem Yunlong Co., Ltd.